Looking for Residential Roof Power Washing in CT? 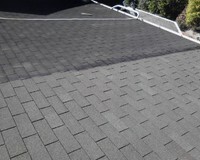 A clean roof looks better and lasts longer! your shingles. Blue Mobile Wash can have your roof looking like new at a fair and affortable price! We're the experts when it comes to removing those ugly sports on your roof that are ruining the look of your hosue. Typical residential roofs can be cleaned in a matter of hours, and the results are immediate! I need Roof Power Washing... can I get a free estimate?